A MIDI Merger has applications wherever you need to combine MIDI datastreams. You may want to combine several simultaneous performances on the input of a computer or a sound module. You may want to run a computer patch-editor to a synth-module at the same time as playing the module from a keyboard. You may have to insert MIDI synchronization (MIDI clocks or Time Code) into a performance datastream. Sadly, you can't combine MIDI datastreams just by joining the wires together. Data that arrived at the same time would clash - and be corrupted into garbage. In addition, the 'bytes' of information must be organised so as to be in accord with the MIDI protocol - so merging MIDI data is a job for a microcomputer with multiple serial interfaces (one for each MIDI port). 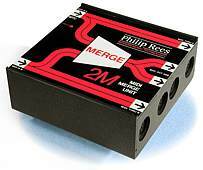 Philip Rees are firmly at the forefront of MIDI merge technology. Our MIDI mergers are widely acknowledged as offering the best MIDI merge functions available anywhere. They recognises all MIDI data, including MIDI Time Code and System Exclusive and have many automatic features to optimise performance and convenience. There are five models: the mighty Little 2M MIDI merge unit, the classic 2M MIDI merge unit, the trusty 3M MIDI merge unit, the high-tech 5M MIDI Merge Unit and the remarkable 9M MIDI merge unit. The Little 2M is a product of our unmatched MIDI merge design experience. Despite its small size and low price, it is definitely a proper intelligent MIDI merger. It has two MIDI IN ports and one MIDI OUT port. The lower MIDI IN has the standard opto-isolated MIDI configuration, while power for the unit is derived via the upper MIDI IN port. Of course, this means that you have to connect a MIDI output to the upper MIDI IN, whenever you wish to run the Little 2M. The line-powered scheme is a significant convenience, as no battery or external adaptor is required. The Little 2M employs a novel power circuit which ensures very good compatibility, so it will work perfectly with the vast majority of MIDI master devices. A wonderful state-of-the-art low-power RISC microcontroller provides a level of performance which was not previously possible in a line-powered unit. An indicator lamp lights when correct power is being received. The same lamp dips to indicate transmit data flow, which makes sure that the lamp is consuming current when the MIDI output is not. To reassure the user that the system is running, the lamp flashes during dense data. It flashes rapidly when the only messages being sent are MIDI Clocks or MIDI Time Code. The Little 2M handles all MIDI message types, including System Exclusive and MIDI Time Code. Channel Voice messages are normally transmitted in the order in which they were received. When the throughput gets very busy, and to avoid unacceptable delays, message types with the most redundancy are discarded first. The Little 2M generates sets of All-Notes-Off and centre Pitchbend messages at power-up. The Little 2M understands and sends 'running status', so you get the benefits of more efficient communication and faster response. System Exclusive messages of any length are retransmitted. More than one simultaneous Time Code master in a system is illogical, so MTC quarter frame messages are only retransmitted when received on the upper IN port. The processor maintains the chronology of Song Position Pointer and Song Select messages with associated System Real Time messages. Our brilliant and widely-imitated intelligent clock interlock system moderates the retransmission of MIDI Clocks, so that the most recently started clock stream takes over. Active Sensing is ignored and discarded, while System Reset is retransmitted and honoured. As in the example left, the Little 2M could be used at the input to a music computer, so that a performance (for example, from a master keyboard) could be recorded by a sequencer program, while other data (such as a patch dump or transfer handshake message from the sound module) is received for filing or processing. The above arrangement will also allow you to audition changes (by playing the keyboard) while using a patch editor program to modify timbres on the sound module. In the examples below, two MIDI performance streams are rendered by a single sound module. In the first case, the keyboard provides power for Little 2M. In the unlikely event that the keyboard MIDI Out wasn't compatible with the line-powered scheme used by Little 2M, you could swap cables so that power is sourced from the percussion pads. Merge units frequently find employment where it is required to insert synchronisation into a performance - especially on the input to a hardware or software sequencer. The synchronisation may often take the form of tempo-relative MIDI clocks. Even if the synchronisation messages are in the absolute time MTC (MIDI Time Code) system, the sync source may be connected to either MIDI IN port  the source will be automatically detected. The Little 2M is probably smaller than you think (it's about the size of a cigarette packet) at 58mm x 69mm x 23mm, that's the same size as our V3. The splendid processor incorporates a watchdog circuit for automatic crash recovery. As the 2M has a built-in mains power supply it has the power available to drive several outputs! There are thru outputs for each of the two MIDI inputs. The merged data is available simultaneously on two MIDI outputs, so you can drive two MIDI slave devices at the same time. Another benefit of the mains powered unit is that a fast processor with large ROM and RAM memory is able to be used. The 2M has multiple large data buffers to minimise data loss. To mitigate undesirable delays, it could become necessary to reject some data. The 2M does this gracefully and automatically according to a priority discard system; redundant data is thrown away first. System Real Time messages (that includes the normal tempo-relative MIDI clocks) and time sensitive System Common messages (including Time Code quarter frame messages, Song Select and Song Position Pointer) are kept in the right sequence and retransmitted at the first opportunity. System Real Time messages are managed by an intelligent interlock system, which prevents clock stream conflicts - see the state diagram above. MIDI Time Code (MTC - that's not the same as MIDI clocks!) and the Universal Real Time System Exclusive messages are only accepted on MIDI IN A. The merging of two MTC streams would be pointless, and indeed two simultaneous sources of Time Code would be bizarre. You just connect a source of Time Code to input A if you want the code to be retransmitted, and to input B if you want the code to be discarded. Very reasonably, the presence of MTC on input A automatically inhibits the retransmission of System Exclusive messages received on input B, in order to assure the integrity and punctuality of the Time Code. The 2M is especially capable of making the most of interleaving System Exclusive transfers, and minimising the disruption of concurrent performance data. System Exclusive messages less than 140 bytes long (the majority) are inserted into a performance datastream. Appropriate action is taken, if necessary, to prevent stuck notes and pitch bend values when longer SysEx messages are to be retransmitted. Pitch bend values, relating to the same MIDI channel but coming from opposite inputs, are arithmetically combined. This is far better that allowing them to clash, which can give horrible results. The 2M understands and sends 'running status', so you get the benefits of more efficient communication and faster response. As it automatically inserts status bytes when it has the opportunity, problems with receiving devices that tend to lose current status are avoided. 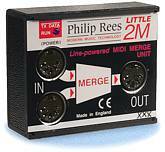 The 2M MIDI Merge Unit is exceptionally compact (109mm x 109mm x 41mm). It has a built-in mains (ac) power supply and the integral mains lead (ac power cord) comes with a plug. Versions can be supplied for both international ac voltage ranges. The 3M follows in the fine tradition of our highly-respected 2M MIDI Merge Unit, but the 3M merges from three inputs in place of just two. The program inside this mains-powered unit has the extra fast, efficient code needed to successfully combine three simultaneous MIDI datastreams. When the data traffic is especially heavy, It may be necessary for the merge processor to reject some MIDI data, especially if undesirable delays are to be avoided. 3M does this gracefully and automatically according to a priority discard system, redundant data being thrown away first. 3M understands and sends `running status'. Time-critical System Common messages, including Time Code, are retransmitted at the first opportunity. Time Code and the associated Universal Real Time SysEx messages are only accepted on MIDI IN A. The 3M can handle System Exclusive messages of any length on any input. As on all our merge boxes, System Real Time messages are accepted on any input and are retransmitted as soon as possible. Clocks are managed by an intelligent interlock system. Pitch bend messages, relating to the same MIDI channel, but coming from different inputs, are also controlled by an interlock system. In the example installation in the diagram above, the sound module can render the combined commands of the synth, keyboard and sequencer. The sequencer can record the synth while it simultaneously plays the sounds on the sampler. 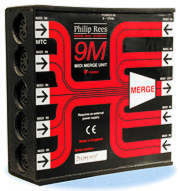 Like many of our products,The 3M MIDI Merge Unit is exceptionally compact at only 109mm x 109mm x 40mm. This includes the built-in mains (ac) power supply (110 V ac or 230 V ac, 50Hz or 60Hz - as required). This provision obviates the need for an external ac adaptor. The integral mains lead (ac power cord) comes with a plug. The useful 3M has, of course , three MIDI inputs, and provides thru outputs for two of these. The MIDI output of the merge processor is available on the third output socket. When you need to drive a MIDI slave subsystem from up to five master devices at the same time, the 5M will come to your rescue. It is a superb high-tech MIDI merge box which requires an external DC power source. The features of the 5M include intelligent interlocks on clocks, pitch bend and certain controllers. The embedded program employs an optimum combination of the message-stream and state-machine models of the MIDI merge function. In the example application above, a 5M combines five MIDI performances into one sound module. The 5M has five MIDI IN ports plus one MIDI OUT. The 5M requires an external dc power source of nine to twelve volts at 200mA, which is connected via a 3.5mm jack, tip positive. In the UK and Eire, a mains (ac power) adaptor is supplied with the unit. The sturdy ABS enclosure is just 109mm x 109mm x 40mm. The 9M is a 9-into-1 DC-powered merge box, which will let the whole band play together via a single multi-timbral sound generator. It would also let a sequencer record many sources of MIDI data simultaneously and avoid the need to switch or re-cable. 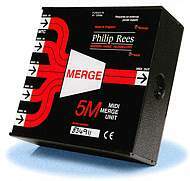 Philip Rees MIDI merge units have earned a first class reputation. We have extended and refined the firmware techniques that made our smaller units so successful. This has made possible a really useful merge box design with a massive nine inputs. The sophisticated data handling features of 9M include our usual intelligent interlocks on clocks and pitch bend . Like the 5M, the program employs a combination of the message-stream and state-machine methods, and it can readily handle all types of MIDI message including Time Code and SysEx. 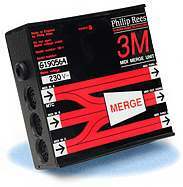 Like all our merge boxes, 9M only accepts MIDI Time Code received on one specified input. This makes good sense. These units must be able to deal with the large potential requirements of handling many data sources. Therefore, the 9M and 5M use a 24MHz processor and the same type of advanced 16C550 asynchronous communication elements as the high performance serial interfaces on personal computers. The 9M has nine MIDI IN sockets and one MIDI OUT socket, which carries the output of the merge processor. The 9M requires an external dc power source of nine to twelve volts at 250mA, which is connected via a 3.5mm jack, tip positive. In the UK and Eire, a mains (ac power) adaptor is supplied with the unit. The sturdy ABS enclosure is just 109mm x 109mm x 40mm. You may need to download the Acrobat Reader free from the Adobe site in order to view or print .pdf documents. The information on this merge box page is also available as an Acrobat .pdf file - size: 669K bytes. Independent review of Little 2M, 5M and 9M by Sound on Sound, the world's best music recording magazine.